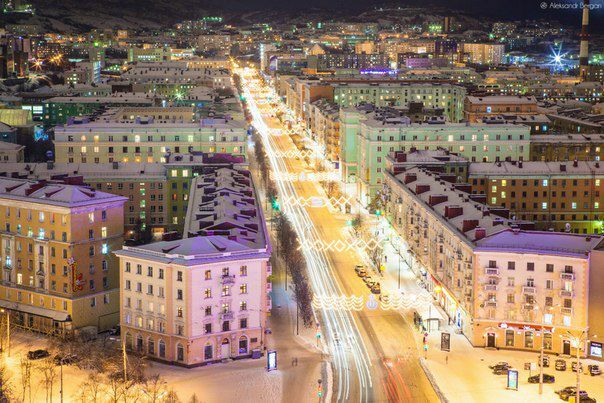 Murmansk is the largest city in the world above the Arctic Circle and the administrative center of Murmansk Oblast. It is an important historical and cultural city largely because of its military and trade significance during World War II. The city is a perfectly preserved slice of Post-Communist Russia since it has not undergone many changes since the Communist Era. Murmansk was the last city to be founded in the Russian Empire when the Russian railway system was extended to the North in 1915. During World War II, the city was one of the most important ports in the country for manufacturing and trading supplies. Murmansk was heavily bombed during World War II by Hitler’s army; the only other Russian city that was attacked more heavily was Stalingrad. Almost the entire city burned down but Murmansk was never defeated. They were granted the honorable title of “Hero City” for their resistance against the German army. During the Cold War, Murmansk was a port for Soviet nuclear icebreakers and submarines, many of which it still houses today. The city remains a port for fishery, exports and passenger vessels. After 1989 the population of Murmansk declined drastically due to the fall of the Soviet Union and the rapidly worsening economic situation. Its current population is approximately 304 500 people. By Train: Trains run daily to Murmansk from St. Petersburg, Moscow and many other major cities. However, due to its location in the far north, it's a long train ride - 32 hours from St. Petersburg. By Airplane: Fly into Murmansk Airport from St. Petersburg, Moscow, and Helsinki. You can stay at the historic 3-star Hotel Artika in the center of the city, or right beside it at the Hotel Meridian, another 3-star hotel on the Five Corners Square. Another popular and central hotel is the 4-star Park Inn Poliarnie Zori. Murmansk has relatively mild weather for how far north it is. In the winter weather is usually around -10 degrees Celsius, and during the summer it usually stays around 12 degrees with rain. Polar nights (24-hour darkness) occur from December 2 – January 11, and polar days from 2 May – 22 July. You may even be able to see the Northern Lights: they occur 15 to 20 times throughout the winter. The Alyosha Monument: Be sure to see one of the largest war memorials in Russia, a 116-ft tall statue of an unnamed soldier in honor of the "Defenders of the Soviet Arctic during the Great Patriotic War" (World War II). St. Nicholas Church: A small but significant Russian Orthodox church named after the patron saint of sailors. Nearby is a commemorative lighthouse, also dedicated to Russian sailors. The Square of Five Corners: This is the central square of Murmansk, housing the DUMA, the main shopping center and the Hotel Arktika. The Hotel Arktika: This was the tallest building above the Arctic Circle when it was built. It is only 16 stories high because taller buildings become unstable due to the cold climate. The hotel is open for tourist visits. The Museum of Regional History: This museum houses four floors detailing the history and culture of the region, including stunning nature and animal displays that kids will enjoy. The Fine Arts Museum: The only art museum above the Arctic Circle. There are more than 3000 works of art on display, focusing on artists from Murmansk and a sculpture collection. The Lenin Nuclear Icebreaker: The first nuclear icebreaker built in the world, the ship is still kept in very good shape. It houses a museum with lots of hands-on exhibitions (great for kids). Tours are offered daily in English, and you can even take a look at the nuclear reactor inside. The Puppet Theater: Great for kids and adults alike, the theater puts on Russian fairy tales for kids of all ages throughout the year, including Christmas tales. The strong visuals mean it's not necessary to speak Russian to enjoy the shows. The Murmansk Regional Drama Theatre: This theater shows Russian plays year-round. This is a great place to soak up some Russian culture.